Draft: 2011, Los Angeles Angels, 1st rd. Christopher John Cron (pronounced croan)...Instagram: @ccron24...C.J. 's father, Chris, played briefly in the majors with the Los Angeles-AL (1991) and Chicago-AL (1992)...was recently named Triple-A Reno manager in the Arizona organization...his brother, Kevin, is a first baseman in the Diamondbacks organization...his cousin, Chad Moeller, was a catcher for 11 seasons in the majors (began career with Twins in 2000)...C.J. was the starting first baseman and cleanup hitter for the U.S. team in the 2013 Futures Game at Citi Field, and went 2-for-4...his father managed in the Tigers organization at the time for Double-A Erie and was on the coaching staff for that game...it was the first time he coached his son since travel ball in high school...C.J. was on a 10-game homerless drought in August 2017 when two-time AL Most Valuable Player Mike Trout offered up season tickets to the NBA's Phoenix Suns in exchange for a multi-HR game...he homered in his first and last at-bats of an 8-2 win over the Athletics...the diehard Suns fan tweeted after the game: "Who wants to go to a Suns game? @MikeTrout I'll save the 76ers game for you." Spent first season with Tampa Bay after being traded on February 17, in exchange for a Player to be Named Later (Luis Rengifo). Started at first base on Opening Day vs. Boston, his fourth Opening Day roster (all starts)...was one of only three players to make the Opening Day roster and remain on the active roster for the entire season, joining Sergio Romo and Jesús Sucre...Reached base safely in a career-long 25 consecutive games from April 21-May 19...Recorded two multi-homer games: April 21 vs. Minnesota and July 29 at Baltimore...Broke a scoreless tie with a two-run ninth inning homer off Shane Greene on April 30 at Detroit...it was the second time in his career he hit a go-ahead homer in the 9th inning or later, following May 31, 2016 vs. Detroit...Hit 16th homer June 19 at Houston off Justin Verlander to match his home run total from each of the previous three seasons...reached 16 homers in his 70th game compared to 113 games in 2015, 116 games in 2016 and 100 games in 2017...Hit a home run 464 foot August 18 at Boston...according to StatCast, matching the longest by a Ray since StatCast started tracking them in 2015...it was also the fifth-longest hit at Fenway Park over that span and third-longest by a visiting player, behind Manny Machado on May 4, 2017 (466 feet) and Nelson Cruz on June 22, 2018 (465 feet)...Hit a solo homer in the second inning for his 30th of the season September 29 vs. Toronto...the homer was the first of his career on a 3-0 pitch...Set career-highs with 140 games, 68 runs, 127 hits, 28 doubles, 30 home runs and 74 RBI...14 of his 30 HR gave the Rays a lead, tied for fourth-most in the AL and tied for second-most for a single season in franchise history behind Carlos Peña (15) in 2007...Hit 19 HR on the road, tied for seventh in the majors and tied for fourth in the AL...Appeared in 140 games and made 125 starts (67 as designated hitter and 58 at first base)...Was hit by pitch 17 times, third-most in the AL...Became the ninth player in club history with 30 home runs in a season, joining Evan Longoria (4), Carlos Peña (3), Steven Souza Jr., Logan Morrison, Brad Miller, Aubrey Huff, Fred McGriff and José Canseco...His 30 HR were 14 more than his previous career high and were more than twice as many as any other Rays player, ahead of Wilson Ramos (14)...hit 20.0% of the team's homers. Appeared in 100 games with 92 starts, all at first base, over three stints with the Angels: Opening Day-May 21, June 3-22 and July 7 through the end of the season... Ended the season with 16 HR for a third consecutive year, tying his career high... Hit .267/.326/.512 (58-for-217) with 14 HR and 42 RBI in 63 games (60 starts) after the All-Star break, compared to .213/.265/.303 (26-for-122) with 2 HR and 14 RBI in 37 games (32 starts) in the first half…his 42 RBI after the break tied Luis Valbuena for 2nd on the team behind Albert Pujols (47)... Made his third consecutive Opening Day roster…started on Opening Day at first base for the second consecutive year, after starting at designated hitter on Opening Day in 2015... Was on the 10-day DL with a left foot contusion from April 29-May 13... On May 21 at NYM, hit his second career grand slam, in the 1st inning off Tommy Milone… according to the Elias Sports Bureau, he became the first Angel to hit a grand slam in the 1st inning of a road game since Casey Kotchman on May 14, 2007 at TEX... On July 16 vs. TB, hit a 2-run, pinch-hit home run in the 8th inning off Adam Kolarek, giving the Angels a 4-2 lead in the eventual 4-3 win… he was the first Angel with a go-ahead home run as a pinch-hitter since Hank Conger on Aug 31, 2013 at MIL (9th inning)…he was the first Angel to do that in a home game since Bengie Molina on Aug 12, 2001 vs. TOR. In sophomore season with the Angels, hit .262 (99/378) with 17 doubles, a triple, 16 home runs and 51 RBI... Improved in nearly every offensive category over rookie campaign including games (113), hits, runs (37), doubles, home runs and RBI...One of three Angels over the last five seasons to log at least 15 home runs during sophomore campaign: Mike Trout - 30 HR in 2012 and Mark Trumbo - 29 HR in 2011. Made three stints with the Halos...Following final recall on June 29, went on to bat .285 (77/270) with 13 doubles, a triple, 15 home runs and 45 RBI... Was one of 11 players in the Majors to hit .285, with 15 home run and 45 RBI in that stretch (Mike Trout also on the list)... His 20 RBI in September were ti ed for fifth in the A.L... Combined to hit .204 (22/108) with four doubles, a home run and six RBI in his first two stints. Seven of 16 home runs came in the seventh inning or later, with two giving the Halos the lead. Tallied a career-high six RBI on July 4 at Texas...Was the 47th such occurrence in franchise history and first since Kendrys Morales accomplished the feat in 2012. Named to first Opening Day roster. After making his Major League debut with the Angels May 3 vs. Texas, went on to bat .256 (62/242) with 12 doubles, a triple, 11 home runs and 37 RBI across three different stints with the club...Despite three trips to the minors, his 11 home runs were tied for sixth overall by an A.L. rookie...Is the third Angels rookie in the last four seasons with a 10-home run campaign: Mark Trumbo, 29 HR in 2011 and Mike Trout, 30 HR in 2012...Eight of his 11 home runs came in his first 40 career games...Joined Wally Joyner (15 in 1986), J.T. Snow (9 in 1993) and Mike Napoli (8 in 2006) as the only Angels with 8+ HR in their first 40 tilts...Homered three straight days from June 20-22 all vs. Texas...Was the first Angels rookie to homer in all three games of a series since Tim Salmon in 1993...Went 3-for-5 with two RBI during in his big league debut...Was just the fourth Angel to collect three hits in their debut...According to STATS, was the first A.L. player with two go-ahead hits in MLB debut since Don Baylor for Orioles on Sept. 18, 1970...A 2011 first round Draft pick (17th overall), was the ninth first-rounder from the 2011 Draft to appear in the Majors: Gerrit Cole, Trevor Bauer, Dylan Bundy, Anthony Rendon, George Springer, Jose Fernandez, Sonny Gray and Kolton Wong...Hit .316 (60/190) in 49 games with Triple-A Salt Lake with seven home runs and 33 RBI. Around the Horn: Who will Twins start at first? November 26, 2018 Minnesota Twins claimed 1B C.J. Cron off waivers from Tampa Bay Rays. November 20, 2018 Tampa Bay Rays designated 1B C.J. Cron for assignment. February 17, 2018 Los Angeles Angels traded 1B C.J. Cron to Tampa Bay Rays for Player To Be Named Later. July 7, 2017 Los Angeles Angels recalled 1B C.J. Cron from Salt Lake Bees. June 23, 2017 Los Angeles Angels optioned 1B C.J. Cron to Salt Lake Bees. June 3, 2017 Los Angeles Angels recalled C.J. Cron from Salt Lake Bees. May 22, 2017 Los Angeles Angels optioned 1B C.J. 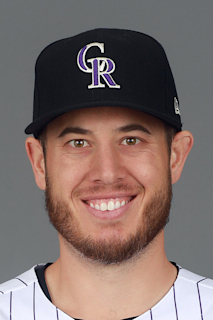 Cron to Salt Lake Bees. May 14, 2017 C.J. Cron roster status changed by Los Angeles Angels. May 7, 2017 Los Angeles Angels sent 1B C.J. Cron on a rehab assignment to Salt Lake Bees. April 29, 2017 Los Angeles Angels placed 1B C.J. Cron on the 10-day disabled list. Left foot contusion. August 20, 2016 Los Angeles Angels activated 1B C.J. Cron from the 15-day disabled list. August 12, 2016 Los Angeles Angels sent 1B C.J. Cron on a rehab assignment to Salt Lake Bees. July 9, 2016 Los Angeles Angels placed 1B C.J. Cron on the 15-day disabled list. Fractured left hand. June 29, 2015 Los Angeles Angels recalled 1B C.J. Cron from Salt Lake Bees. June 14, 2015 Los Angeles Angels optioned 1B C.J. Cron to Salt Lake Bees. June 6, 2015 Los Angeles Angels recalled C.J. Cron from Salt Lake Bees. May 26, 2015 Los Angeles Angels optioned 1B C.J. Cron to Salt Lake Bees. September 2, 2014 Los Angeles Angels recalled C.J. Cron from Salt Lake Bees. August 10, 2014 Los Angeles Angels optioned 1B C.J. Cron to Salt Lake Bees. July 23, 2014 Los Angeles Angels recalled C.J. Cron from Salt Lake Bees. July 19, 2014 Los Angeles Angels optioned 1B C.J. Cron to Salt Lake Bees. May 3, 2014 Los Angeles Angels selected the contract of C.J. Cron from Salt Lake Bees. April 1, 2014 1B C.J. Cron assigned to Salt Lake Bees. January 14, 2014 Los Angeles Angels invited non-roster 1B C.J. Cron to spring training. November 29, 2013 1B C.J. Cron assigned to Leones del Escogido. March 31, 2013 1B C.J. Cron assigned to Arkansas Travelers from Inland Empire 66ers. March 22, 2013 1B C.J. Cron assigned to Los Angeles Angels. September 22, 2012 C.J. Cron roster status changed by Inland Empire 66ers. August 29, 2012 Inland Empire 66ers placed 1B C.J. Cron on the 7-day disabled list. Right labrum injury. April 2, 2012 1B C.J. Cron assigned to Inland Empire 66ers from Orem Owlz. September 5, 2011 C.J. Cron roster status changed by Orem Owlz. August 28, 2011 Orem Owlz placed 1B C.J. Cron on the 7-day disabled list. June 29, 2011 1B C.J. Cron assigned to Orem Owlz from Los Angeles Angels. June 28, 2011 Los Angeles Angels signed 1B C.J. Cron.